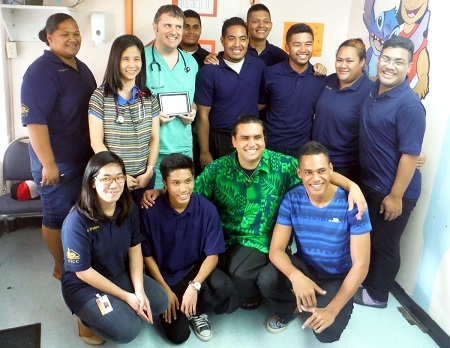 Every semester, the International Student Organization (ISO) at the American Samoa Community College (ASCC) engages in a Community Service project, and for spring 2015 they hit upon the novel idea of creating a more child-friendly atmosphere throughout the Pediatric Clinic at the LBJ Hospital. The project concluded on Monday, May 4th, when the ISO made the official presentation of six large-sized cutouts of popular cartoon characters which have been mounted on the walls in various areas of the clinic. LBJ Pediatric Clinic staff Dr. James Marrone, Dr. Maria Gayapa and Nurse Avei Pou represented the hospital in the receiving ceremony, which included a small plaque commemorating the donation. “Most children visiting the Pediatric Clinic are often not feeling well, and in addition they often feel apprehensive in an unfamiliar environment. We hope that the presence of cartoon characters easily recognizable by the children will help put them at ease,” said ISO Staff Advisor Mrs. Tala Ropeti Leo. The cutouts of cartoon characters Lilo and Stitch, Elmo, Olaf, Mickey Mouse, Hello Kitty and Dora the Explorer are the work of ISO members under the direction of artist and ISO Vice President Zachary Faulkner, son of renowned local artist Mark Ashley Faulkner. Using materials donated by Ace American Industries, the ISO students started by cutting a four-foot section of plywood into the shape of each cartoon character, then painting the character’s likeness on top. “It was a fun project, and the results were spectacular,” said Mrs. Leo. In addition to its Community Service project, every semester the ISO also awards a scholarship of $500 to a qualified student who is not eligible for the Pell grant or other federal financial aid. Applicants must also have a cumulative grade point average of 3.0 or higher, and be working towards an Associate in Arts degree or Certificate. This semester’s recipient of the ISO Scholarship is Ms. Hadassha Tofilau. With a highly impressive GPA of 4.0, Ms. Tofilau, the daughter of Mr. Vincent and Mrs. Jamrul Nisha Tofilau, is the youngest of three children and enjoys reading, writing and socializing in her spare time. She hopes to graduate from ASCC in spring 2016. Under the auspices of the Division of Student Services, the ISO strives to promote unity among all students at the College regardless of race, color or ethnicity, encourage students to share their values and customs with each other, encourage international students to participate in school activities, reach out to help the community, and provide a scholarship opportunity for non-Pell international students to further their education at ASCC. “We encourage more students to apply to our I.S.O scholarship in the upcoming fall semester,” said Mrs. Leo, who can be contacted at 699-9155, ext. 461, by anyone seeking further information on the International Student Organization.